Growing up I was enamored with a show called Homicide: Life on the Street. It followed a unit in the Baltimore police department, as they used their detective skills to solve murders, and their short tempers to argue even the most minute annoyances of life over the bodies of the broken and defeated. The show was filmed mostly on location, with its dark architecture and quiet, dirty streets. Something inside me wanted to be there, to live in Baltimore and serve the dead along with the cast and crew, to document their vengeance when myself and the rest of the unit brought their killers to justice. Nothing since the show has made me want to move to Baltimore, to breathe the same air that Edgar Allen Poe once took in and exhaled drearily, than Nik Korpon’s writing. With Stay Go_d, his Damon slithered through the alleys, racing from the demons that chased him into the darkest of corners, into the cracks of old buildings, hiding from responsibility. 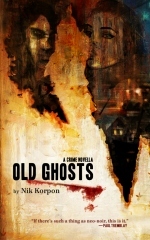 In Old Ghosts, Cole works for a contractor, rebuilding the city’s old homes from the soul of the haunted Baltimore houses outward. His living in the city, starting a family with his yoga instructor wife, Amy, is a little more than simply rehabilitating buildings, he’s reconstructing his old life. Cole used to live up North, running through the streets with his old friends, Chance and Delilah, leaving chaos in their wake, dealing in drugs and destruction. He left all of that behind when he was stabbed in the stomach, when his life sliced through his own foundation and brought him to the ground. Moving to Maryland was supposed to be a fresh start, working for his boss Paddy, going home and trying to conceive a child with Amy, it was meant to be a fresh coat of paint, a restructuring of his soul’s layout. But life follows Cole when he shows up to a new project being paid for by a strange, possibly, married couple paying in cash and making strange demands. Although Old Ghosts is shorter, it doesn’t mean that it’s less of a work than Stay Go_d. If anything, the writing is tighter, far more mature than that in Korpon’s debut novel. Page 64 of the story, for instance, is quite possibly the most suspenseful piece of writing penned in quite sometime. Cole is in the basement with his old flame, now his boss, and Cole teeters on the edge of life and self-destruction. He spends much of the story pawing at the inside of life’s pit full of vipers, their heads smooth and streamlined, hoping they’ll push against him in thanks for his attention. He knows full well what the petting could lead to, the loss of body and soul, the loss of his job, the loss of his budding family, but sometimes a gun is pressed against your temple. Sometimes you reach in the pit just because. And sometimes living with the ghosts of the past is worse than not reaching in at all.